Best Essays Review: discounts, promo codes and prices. Best Essays is an online writing service that specializes in academic writing and resume/CV services. Before we sat down to write this review, we explored the website, ordered an essay, and communicated with our writer and customer service reps. We also read BestEssays customer reviews and searched for BestEssays BBB, so we could verify that BestEssays is not a scam. Keep reading and we will let you know what we found out. Let’s start our BestEssays Review with the services that the company offers. Nothing here particularly stands out. The company offers writing assistance with various types of assignments includinging essays of various types, book reports, research papers, lab reports, classroom assignments, presentations, etc. They also write resumes, CV, and cover letters. Nothing was mentioned on the website about business writing, so those needing copywriting services should probably move on. We had the opportunity to message back and forth with our writer on multiple occasions as he worked on our essay. We selected a 5 page business essay on the topic of ‘marketing in the 1950s’ as our topic. We selected the longest period of time offered (10 days), and we didn’t make any extra requests or order any other services. Let’s start with the BestEssays.com pros & cons. The writer was very courteous. Unfortunately, the paper just wasn’t up to par. It was factually accurate, but it did not flow smoothly, and was very poorly organized. It was in desperate need of editing and proofreading. This makes us believe that there is little or no quality checking done before papers are provided to customers. Eliminating this step can have very detrimental results. This definitely had a strong, negative effect on our Best Essays rating. We checked out the company’s pricing page, and it appeared to us that the pricing is on the high side of normal. That would be acceptable had the quality matched the amount of money that we paid. We also noticed that there was a lot of ‘nickel and diming’ when it came to additional features. We believe that if a company is going to charge a premium price, that should cover quite a bit. Customers shouldn’t have to shell out for extras. Someone in our office noted that it was like paying an entry fee into Disney World and then having to pay extra to get on any of the rides. All standard payment methods are accepted. There are BestEssays discounts for large orders and loyal customers. They also run a VIP program. This isn’t a discount program, in fact customers pay extra for this, but it was advertised on the discount page. Email subscribers are offered additional BestEssays.com coupon codes. 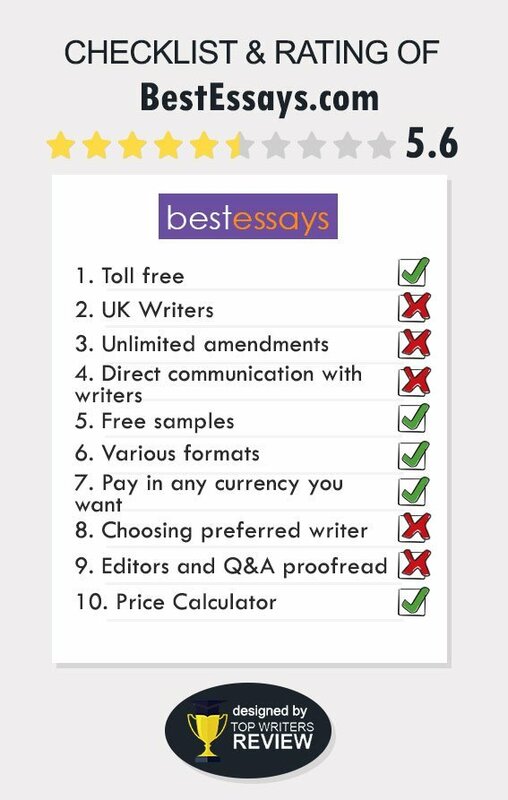 Considering the steepness of BestEssays.com prices, we were hoping to find a Best Essay promo code or two on the internet, but we did not. One thing that we enjoy doing is exploring writing websites to see what they have to offer. In many cases, there are blog posts and articles on a variety of topics. Some websites do a great job of sharing content that their customers need. Unfortunately that wasn’t the case here. There were some Best Essays testimonials, but that was about it. We have definitely reviewed worse writing services. While this one isn’t awful, there needs to be a lot of improvement in quality before we could begin to consider giving this writing service our seal of approval. Our final recommendation is that you consider another writing service. You just won’t get a good value for your dollar here. These guys are way too confident of their ability to provide quality writing. So, they have much higher prices than average on the market and they work too slowly for academic assignments. The company has nice support staff though. But still, I wouldn`t recommend anyone to work with BestEssays. Completely unprofessional staff. The support team cannot help you and answer your questions. I also got my paper later for an hour and nobody even told me about it beforehand. I am very disappointed! I couldn't find anything pleasant with cooperation with writing company! The level of professionalism is quite law. The provided papers are also of not very high quality! I received my paper within the timeframe we`d agreed upon but it was awfully written with lots of grammar mistakes and factual inaccuracies.